This is a second part of a series of articles on Australian tourism in line with the current slogan, "Where the Bloody Hell Are You?" a campaign which has been gaining tremendous popularity among travel buffs who want to get a unique and authentic Aussie experience. -Ed. 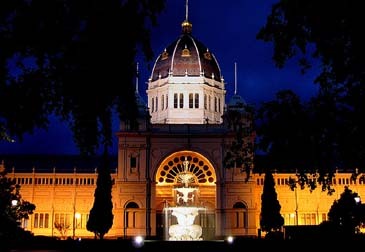 Melbourne — The quests for gold and riches, which have been immortalised in various myths and legends, depict men's indomitable spirit for adventure. They sail on from far away lands braving the raging seas, tragic tales of shipwrecks, and beheadings from the natives — to bag that glorious prize. On a holiday to Victoria more than a year back, a mainstay tour guide of the Victorian Parliament once boasted of genuine gold that decked the walls and ceilings of the state's legislative house. The building was erected during the Victorian Gold Rush era dating back the 1850's onward and, hence, its intricate interior is studded with gold. Then, he convinced guests of the riches the state had enormously possessed. The adornment glittered, arousing deep curiosity among suspicious beholders. One sunny morning of July 2006, an amiable driver-guide of Australian Pacific Touring (APT), who introduced himself only as Frank, took his seat to take charge of the steering wheel of a luxury coach. He then started to brief his passengers over a microphone of the amazing destination we have yet to discover. Then, he spoke of gold, and more gold awaiting to be unearthed— bemusing his passengers who come from various parts of the world to experience a not-so-ordinary Down Under adventure. This is a one-day guided group tour and certainly, we were not bound for the infamous El Dorado. We were heading for Ballarat, Australia's largest 1850's gold mines, 120 km west of Melbourne. 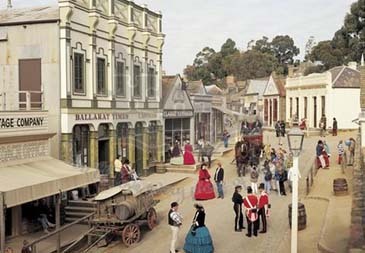 Many Victorians have spoken of Ballarat as an industrial town and a living museum which takes visitors back to old times. Local prospectors had flocked to the area in search for gold, including foreigners who had joined in the earlier California Gold Rush. One of Victoria's treasure chests is now famously represented in the Sovereign Hill—crowned as Australia's top premier destination. Here, the Gold Rush days from 1850 onward come alive. Sovereign Hill has been consistently bagging the most-coveted Victorian Tourism Award for three years in a row since 2003 for its historical, cultural, and educational value. 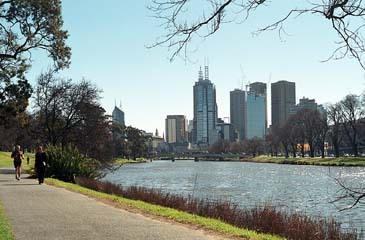 The trip began at 8: 30 in the morning at Swanston Street in the Central Business District (CBD) of Melbourne. The APT coach drove past "under the clock," a.k.a. Flinders St. Station, then to the Southgate before we finally exited from the city towards the expressway. The route plied along Ballarat Road passing by the Deer Park and farther down the plush residential village of Caroline Springs. We were free as the breeze— moving along a well-paved highway amid the refreshing sights of vast farm and pasture lands. There are various vegetables grown on both sides of the road, the source of most veggies served on Aussies' dining tables, as well as the barren fruit trees chilled in winter air. There were road signs of koalas and kangaroos and soon after, sights of kangaroos appeared at a distance; but we had yet to see the koalas tightly gripping on or chewing some eucalyptus leaves. The highway traversed some rolling hills where we seemed to ascend to the clouds and the coach was soaked in the driving rain, albeit briefly. Soon after, the same road was a bit drier. The sky is infinite and within a distance, there wasn't a gray cloud hanging and the sun shone brightly above the earth. After two hours or so, we're entering Ballarat, a town that stood witness to the tumultuous times of Australian Gold Rush days. Our coach was welcomed by a number of significant landmarks, including the Ballarat Cemetery, Eureka Centre, the Mining Exchange Gold Shop, Craig's Royal Hotel, and the rows of antique buildings standing in the whole downtown. Yes, Ballarat deserves that cliché: "an open museum." On a contemporary setting, the Wendouree Lake, a meter-and-a-half-deep, will never be forgotten as the venue of the 1956 boat-rowing Olympic competition. There are residential houses with gorgeous exterior designs— facing the lake. Our guide explained that housing costs range from over $290,000 to half a million dollars. The vicinity becomes even more refreshing with the sight of botanical garden few meters away. Ballarat is a peaceful town despite some few industrial developments. The town's major industries include textiles, small engineering, food products, brick and tile manufacture, building, prefabricated housing, and automotive components. But top source of income is generated through hospitality and tourism. Going to Sovereign Hill without dropping by the Wildlife Park—a 5-minute distance away— would be an opportunity lost, especially for families with children and senior members. Our coach dropped us for a visit before noon. Chris, the wildlife keeper, greeted his guests at the main gate. Then, he guided us towards the petting zoo where the kangaroos have been expecting some visitors carrying some feeds which they could feast on. There are about 450 animal species in this park. Here, animals are treated like ordinary humans. Visitors from all walks of life can interact with the wildlife. They can feed the kangaroos and pat as well as caress the koalas and wombats. Chris also demonstrated how to feed his Tasmanian Devils. Opening the dimly-lit borrow of wombats, he narrated a heart-rending tale how his wombat was orphaned at an early age. His mother was a victim of a car hit-and-run one fateful day in the highway. His wombat has found refuge and home in the Wildlife Park. 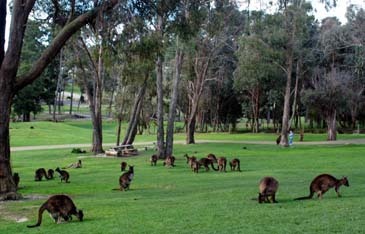 The Wildlife Park is set on a sprawling 32 acres of woodland covering a collection of Australian native animals. It is often toured around for educational and conservation purposes. The reptile collection, which is last part of the tour, is one of the largest private collections in Australia featuring about 400 of both native and exotic origins. Time flies; the clock strikes twelve. Chris eventually bade us goodbye. The main highlight of the trip is about to begin. 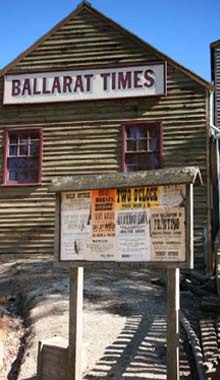 Australia prides Sovereign Hill as a representative historical destination. Occupying 25-hectares of land, it is a recreated goldfield township containing the world's riches alluvial deposits. The township is composed of over 60 old building replicas, about 50 working horses, and craftsmen at work in traditional 1850's trades. Founded in 1970, barely more than three decades ago, Sovereign Hill has drawn about half a million of visitors last year, 30 percent of whom are international visitors. The UK's Royal Family has been charmed by the attraction. Queen Elizabeth has toured the place as well as Prince Charles and the late Princess Diana in their early years of marriage. Other famous personalities who had experienced gold mining adventure include Stevie Wonder Band, Joan Rivers, Rolf Harris, Dennis Lillee, Eartha Kit, Desmond Tutu, Susannah York, and Michael Edward Stevens, to name some on the guest list. There are about 19 highlights to be experienced when you enter the recreated park. Visitors are given a map to explore these adventures. But If you only have three hours tour, here are the must-see or do activities— unless you plan to stay overnight: pan for gold at the Diggings, watch a $50,000 gold ingot poured at the Gold Smelting Works, take a coach ride around, see the Redcoat Soldiers at 1:30 pm, and take the underground Gold Mine Tour. Experience gold panning on the long and winding creek where water runs through. In old days, folks dug through the waters with shovels and poured out on the pan. It is said that gold dusts were abundant. Today, gold dusts are still poured into the water for visitors to try their luck. So, if you're lucky enough, you'll bring home the gold dust — all for free. On the other side of the township, a gold mine was discovered a kilometer below the ground about 30 years back before Sovereign Hill was transformed into a theme park. It is believed that about four private miners worked hard for a living here. Although hardly any evidence was found, the Victorian government believes mining activity had taken place and was stopped before the breakout of the First World War. Discovered here were abandoned water pump, drilling and blasting machines, and some traces of gold nuggets. Today, visitors can journey through a 40-minute guided Gold Mine Tour that takes them to the actual underground site. Take some refreshment somewhere to re-energise yourself. Dining places are listed in the handy map. You may try New York Bakery, a restaurant and bar where you can both dine and drink from breakfast to dinner. Don't be surprised though if a man in costume comes in and ballyhoos everyone to trade his gold nuggets. It's all but a show! There was a rain shower outside and the sky was overcast, but the fun on Sovereign Hills went on. Children in costumes were playing jump rope, while adults in group stopped for a gossip. In a live classroom, a strict teacher was teaching her pupils cursive writing. We dropped by the Foundry to shop for souvenirs. There were goldpans and brasswares spun on steam-powered lathes. We bought some gold-plated stuff like bells which look real as gold and decorative pans. The gold-plated frying pan flashed which could brighten up the kitchen. We wouldn't be able to see The Blood on the Southern Cross which revives the Eureka Stockade. This is regularly being shown after dusk. We heard that the event is fabulous and spectacular featuring lights and sounds which re-enact the miners' bloody rebellion. It was 15-minutes before three o'clock. We wanted to stay, yet we have to individually make our own way out to meet our coach. Frank was waiting, but he was so generous to extend the trip for 30 minutes more. We took the last leg of our tour to the Gold Museum at the opposite side of the road which displays vast collections of all kinds of gold found in Ballarat, including those donated from overseas. The passengers boarded the coach back looking quite satisfied. Frank asked if anyone has ever found a gold nugget. A pale laughter cracked up. We were amused— apparently not lucky enough to find one. He then announced we're heading back to Melbourne before he turned on the video to show the life story of a beautiful Australian wildlife—the kangaroo.